If the interval of 5th (P5) goes further up or down from the key of C# and Cb, then there are more keys to explore than 7 sharps and flats. Any musical note or key signature can be named differently. For example, note C can be named as B#, Dbb and so on. Similarly with the key signatures, Major keys with 11, 12, 13, 14 flats are not named as Abb, Dbb, Gbb, Cbb, but they are simply called G, C, F, Bb. Audibly, they sound the same, but spelt differently because are needs to satisfy or adjust a musical rule (or many other reasons) in the particular situation. 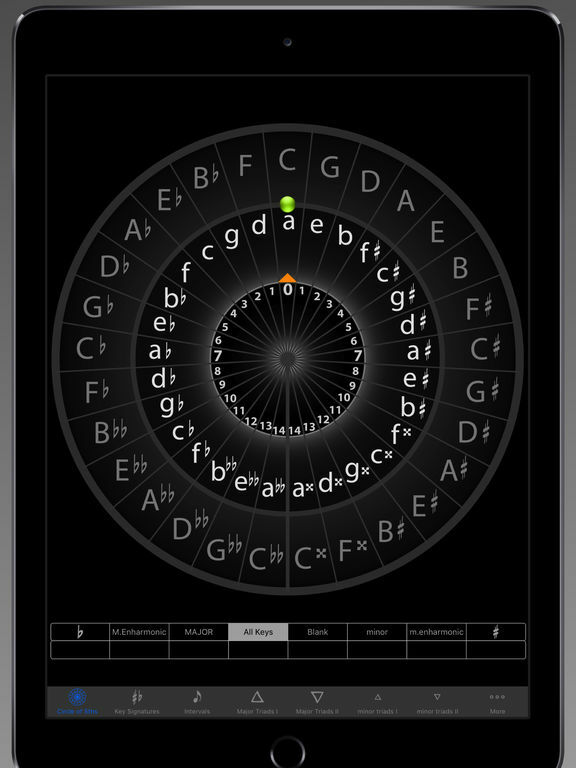 This version has enharmonic key spellings that show all key signatures clearly and how each key is related and dependent each other. Understanding these enharmonic spellings is very important. 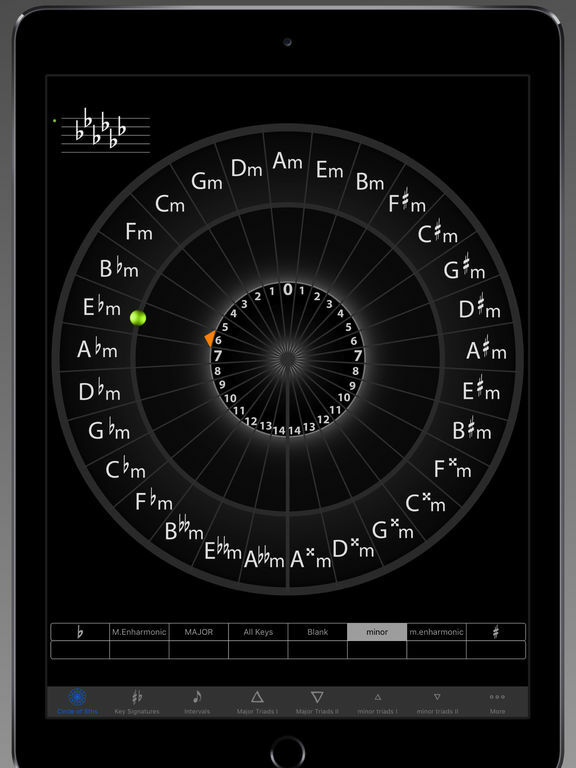 This App unlocks complete enharmonic key signatures that help to give a deep understanding of the circle of fifths and other related issues. Works well with the other two versions of Circle of 5th with multitasking between those three Apps. Let us explore and discover hidden musical keys! 6. 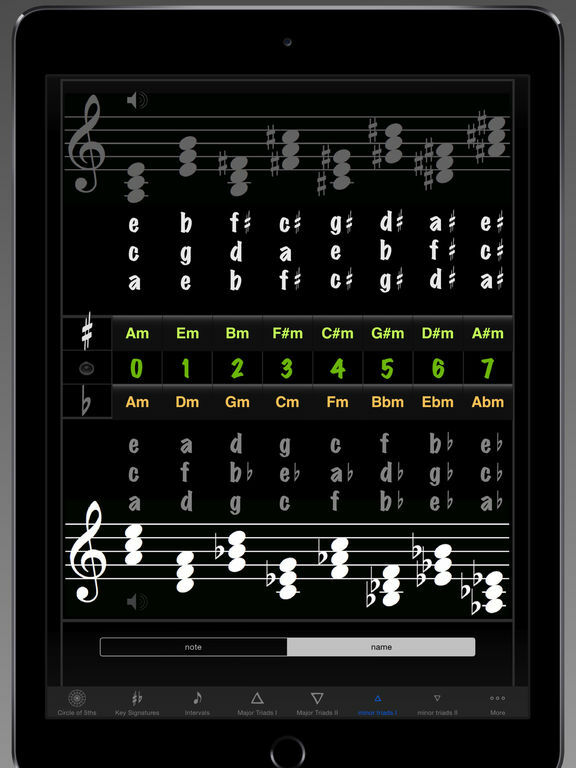 Diatonic scales (Major, natural, harmonic & melodic minor) with sound and formula. 7. 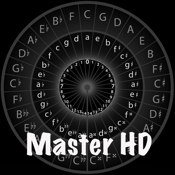 A complete set of Major & minor triads with sound and formula. 9. The overtone (harmonic) series with sound. 10. Full support for Retina display. Memorizing and visualizing the diagram is always highly recommended. ‘Circle of 5ths’ collection series is a comprehensive library for all musicians, composers, music teachers, lecturers, professors, students at all levels and music enthusiasts. 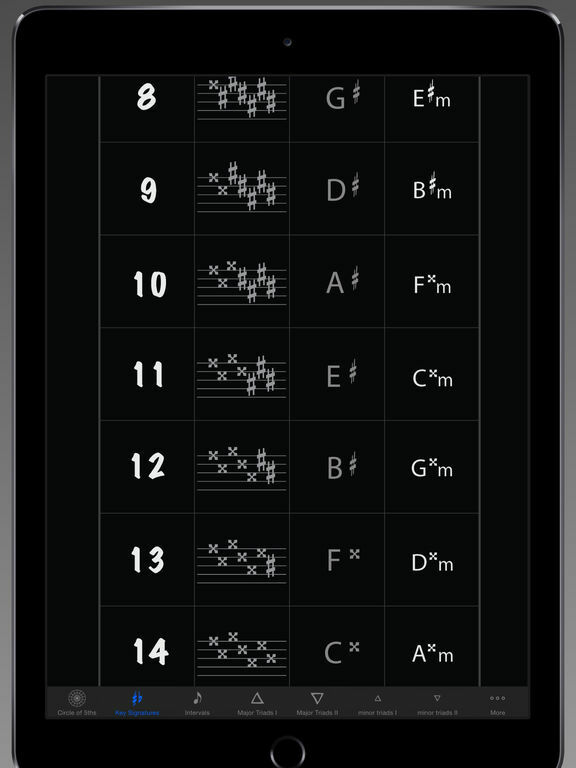 It includes various musical components such as key signatures, intervals, scales, triads and so on. They are essential for musicians. The series is designed to help to develop the aural perception as well e.g. relative pitch and perfect/absolute pitch. Just like eyes to see and recognize things or colors, it is important for the musicians to develop their ears to hear musical sounds clearly and be aware of what they are hearing. ‘Circle of 5ths’ series has all the contents that musicians have to know in a simple form. Use them as a handy reference as well as a study and teaching guide and for training of the ear. Learn, develop, maintain your musical knowledge and sharpen your ear with the series. Collect them all!